Most of the industry is turning its back on the self-serve concept. Opting instead to build flex and exterior-only locations as self-serve volume and revenue continues to slip across the car wash landscape. automatics, three self-serve bays, and two pet wash tubs. But self serve is not dead. It is still a viable and thriving concept. It just requires investment and reinvention. Dennis and Erin Dreeszen believe in doing self serve big. Dennis and his wife Erin are certainly not afraid to invest in the concept. Since opening their first Autowash location five years ago, the couple has opened six more self-serve and in-bay automatic sites, with a seventh set to open its doors this month. That is some serious investment and a clear dedication to the self-serve model. 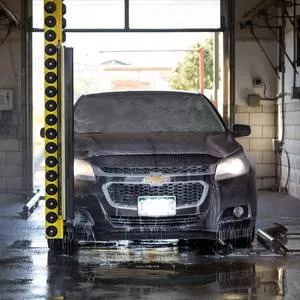 With seven and soon to be eight Autowash locations under their banner the Dreeszens have certainly put their money where their mouths are in terms of the future of the self-serve car wash industry — but they are not done yet. The car wash entrepreneurs are not even half way to their ultimate goal of 25 Autowash locations. The façade features natural stone enhancements. 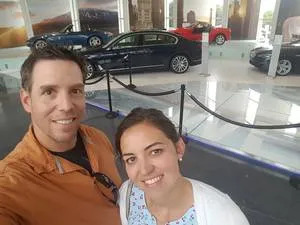 With just five years of experience under their belts, the Dreeszens can still be placed in the car wash newcomers’ bracket, but the couple is far from green. The car wash investors have been ardent students of the industry since 2006, when they first became enamored with the industry and began saving and planning for their first location. Dog wash customers pay just $1 per minute. When it was finally time to pull the trigger and open their first location, the Dreeszens didn’t dip their toes into the shallow end of the car wash pool, opting instead to dive right in head first and swim with the big boys. 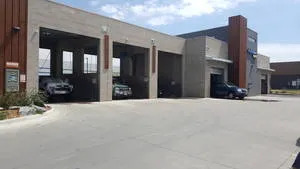 The couple’s first location in Stapleton features three self-serve bays, three in-bay automatics, and two pet-wash tubs. “There is always going to be a need for self serve,”says Dreeszen. “There are so many people that we see out here who want to love on their cars themselves. There is still a market for that. Probably 60 to 70 percent of the people don’t want to do that, and that is fine. I don’t think self serve is the primary look of the industry, but for us it is our niche and we do it well. Kärcher is the in-bay automatic of choice at Autowash. A major portion of the Dreeszens’ success is thanks to their ability to build Autowash into a brand. A brand that delivers a consistent experience and consistent results regardless of which Autowash location a customer chooses to frequent. That consistent experience starts from the ground up with an ideal mix of three in-bay automatics and three self-serve bays. 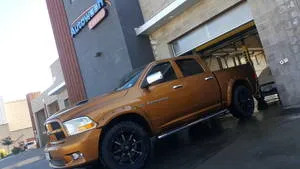 All Autowash locations that were new builds sport this configuration, while acquisitions are as close to an even split between in-bay and self-serve bays as possible. To ensure a familiar and consistent user experience across the growing brand, all Autowashes are outfitted with the same equipment. All automatic bays sport Kärcher equipment, while each and every self-serve bay has the same high-pressure wands, low-pressure foam gun, foam bush, and hand-held dryer. Autos exit the in bay clean, shiny, and dry. In addition to the dependable equipment array, Autowash has another key weapon in its brand-building arsenal: its unlimited wash club. Traditionally self-serve locations have struggled with the logistics and technology investment unlimited wash clubs require. The Dreeszens have solved both of those challenges with the development of their own unlimited wash club mobile app. Dennis has a background in information systems and designed and developed the geo-fenced mobile application. When an unlimited car wash member enters any Autowash location and launches the mobile app they are given a unique code which they can enter into the point of sale to activate the equipment. 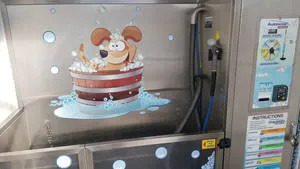 Membership entitles customers to one service per day — self serve, the top wash in the in-bay automatic, or a dog wash. While most unlimited wash programs limit the customer to just one automobile, Autowash’s solution places no such restriction. 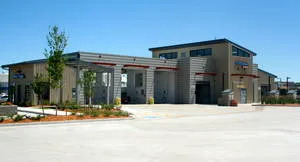 As long as the club member is onsite they can use the equipment to wash any automobile, or pet, they choose. That independent spirt is what sets the Dreeszens and their chain of washes apart from the competition. They refuse to simply follow industry trends. They are blazing their own path to success fueled by a dedication to providing customers a differentiated experience and filling an ignored need in the market.